It all starts with Ashland for me. This isn't me wanting them to join because the G-MAC needs them, but who wouldn't want them if they want to join? I think the admin had taken a long look at both sides of the debate. Watching expenses is crucial for most of the D2 and lower programs so I think this trumps the alumni base and their very compelling reason of liking to mix it up with the larger GLIAC schools as their reason to say. In the end money wins out and the Eagles join the G-MAC in 2018-19. With Tiffin joining next year that makes it 10 football schools, the minimum you would like. So now the GLIAC has to scramble and find another football school. The GLVC is down one with St Joe closing its doors. I think William Jewel will eventually transition down to D3 so that makes it two football schools lost. St Benedictine is rumored to be wanting to move up to D2 but would that be enough to keep UINDY in a conference that they were instrumental in helping to create? UINDY alumni have not been happy with the level of play in football in the GLVC. I have read and talked to one guy who said they have been "soft" since joining. They want to be great in football and they have a very good men's basketball team that should be ranked high next season. It's going to be a huge dog fight between GLVC, the GLIAC, and the G-MAC. Our conference sees a huge opportunity to really improve our league. The addition of UINDY and to a little lesser extent Ashland makes the GMAC one of the best basketball conferences in the nation. Will that be enough to sway the football alumni who want to return to a more punishing football schedule in the GLIAC? With Ashland joining will that take a lot of the luster off the GLIAC football image and inspire the Hounds to renew their old rivalry with Ashland on the gridiron? It just makes sense to UINDY and in a surprise announcement, they too join the GMAC in 18-19! So we now have 11 football teams. Not good but not crushing either. But man, 12 is better than 11 so let's get another football school. Please understand it was just a guy on a late Friday messing around. I'm with you. Although I'd rather see U Indy in the GLIAC (like old days) the travel time is favorable to GMACs Kentucky Wesleyan, Findlay, Ohio Dominican, Hillsdale, Findlay. GMAC football schools are located west toward U Indy. GLVC football schools are located west away from U Indy. I'm just not sure the numbers end up pointing that way. Hope they look closely at the numbers and get people involved in the look. I've heard a little of everything: join Butler in the Pioneer Conference plus D1 Basketball, wait and see what Ashland does, wait and see if Marian gets on board with D2, join the GMAC before it's too late. Maybe waiting on Ashland has some GLIAC implications? Don't think anyone is waiting on Lewis, Southern Indiana, Bellarmine anymore. Hoping they don't base it on the strongest lacrosse conference! President is a lacrosse guy and the AD is a softball/olympic sports fan. U Indy fans are definitely Football crazy. Last game I was at had some energy flowing and a big crowd. I wouldn't think joining Butler in that conference would boost football in my opinion. I just do not get wanting to become D1 in basketball just to see if you can become the next Butler or whatever. I get it means exposure but the risks far outweigh any reward in my opinion. Hell jsut join the G-MAC and bring BU with and we will have an insane D2 basketball powerhouse conference!! U Indy vs Hillsdale with huge crowds the last few years home and away. Would elevate that game to a new level if they were in the same conference. GMACs Findlay and Ohio Dominican very nice road trips too. I'm of the opinion that both the UIndy President and AD are huge supporters of the football program. Would it be nice to show more support by providing additional funding and stadium renovations....yes. Does that mean that by not expanding the stadium and providing additional funding they like lacrosse more than football....no. 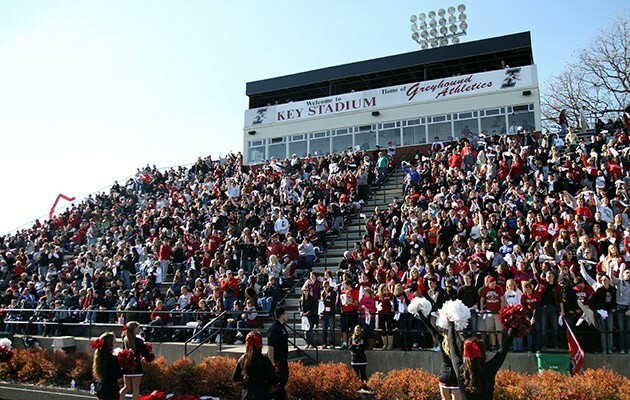 It's readily apparent to see the support, pride and student involvement the football program receives from the students at UIndy. From the 10k+ they had attend a game last year to the buzz around a single spring ball game.....it's there. The sooner they make the jump to the GMAC the better....IMO. The GLIAC doesn't make sense as it's increasingly difficult for private universities to compete with public ones. Not complaining, just an opinion is all. The GMAC is a better fit for a variety of reasons that are quite obvious. Me being positive: They should take advantage of all the support U Indy fans give their football program now while it's still hot and build on it! I've been to 15-20 different D2 stadiums and that U Indy place really is jumping on game days. Joining the GMAC to build "local" rivals and giving my family a place to sit at the big games are a couple good ideas. Stay positive as there's a lot to be positive about. I'm as bullish on the program as ever.